The goal of the current study was to extract natural nonverbal behaviors that are implicit but specific to strangers and friends and to test the expressiveness of these nonverbal behaviors in two different levels of closeness using 3D agents. An experiment was conducted in which 48 pairs (48 strangers and 48 friends) of participants had casual conversations about recent events for 10 min. Their body movements were recorded by a motion-capture system, and 13 vectors were defined on the upper body to compute the cosine similarity for each frame in order to extract the motions. The motions specific to strangers and friends were identified and two scenarios were created using those motions. The scenarios were implemented using 3D agents of a female human and a humanoid robot, and 400 respondents were asked to evaluate the closeness that the agent seemed to express toward the counterpart. 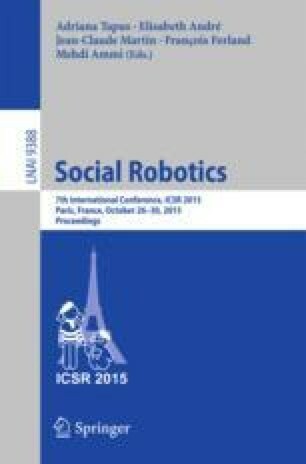 The results showed that a human-agent performing friend motions were evaluated higher in expressiveness closeness than friend motions and a human-agent and a robot-agent performing friend motions were evaluated lower in strangeness than friend motions. In future works, we aim to improve the scenarios and implement them in humanoid robots.